See Some Outstanding Research Tomorrow! in the Gamble Room of Rush Rhees Library. Last year I was able to present at the spring conference. My talk was titled “For the Camera: Representations of the Minority Experience in Performative Video Works.” I spoke about feminism in performance art and representations of gay women and other minorities in photography, and the impact of these depictions. It was such a wonderful opportunity to share this research that I was doing in an area of interest. I was also able to discuss how my own artwork fits into conversation with these themes. I have had such wonderful experiences in my Women’s Studies courses, so it was nice to be able to talk about how those classes have impacted me beyond the classroom. This year there will be presentations on a variety of exciting topics including: activism, literary and film analysis, experiences of transgender individuals, feminism and women’s health abroad. With such variety there is bound to be something to fit everyone’s interests! A full schedule of events is available here. The conference runs from 10:15am t0 3:00pm, and people are welcome to stop in whenever they want. 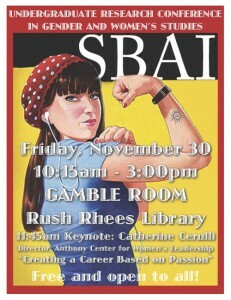 Make sure you don’t miss the keynote address at 11:45am with Dr. Catherine Cerulli, the new director of the Susan B. Anthony Center for Women’s Leadership. 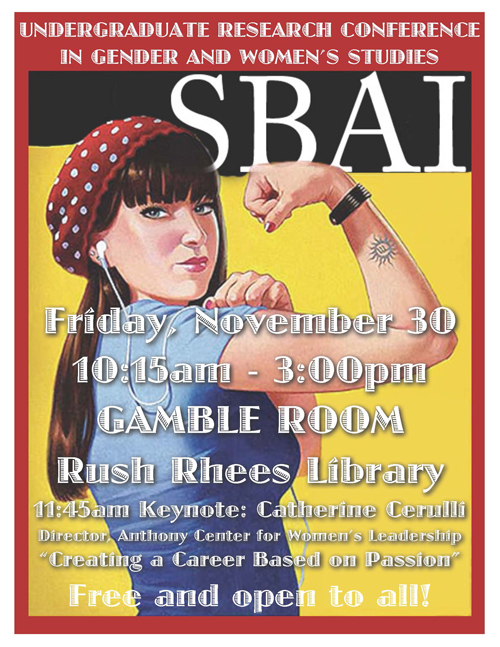 This entry was posted in Guest Blogger, SBAI Events and tagged #conference, #genderstudies, #guestblog, #research, #undergraduate, #women'sstudies. Bookmark the permalink.